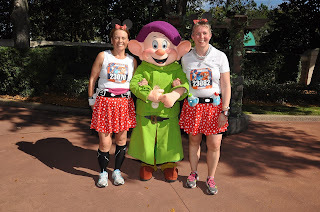 I probably mentioned that my friend Barbara and I signed up for our big scary goal and will be running the Dopey challenge in Disney World and then the following weekend we are running the Rebel Challenge in Disneyland. We will be running 6 races in 11 days, 109.4km, 10 medals coast to coast. Barbara and I ran the Goofy together a few years ago and we made a promise to do the Dopey together. Barbara wanted to do the Star Wars themed race so I suggested we do them back to back...me and my big mouth. I have been teaching the half marathon clinic and training for a half marathon and a marathon this summer, well sort of training for a marathon and I had this big goal in the back of my mind as well. I was not sure how to train for this big goal and then I saw that Run Like a Mother was having a Dopey training plan. I thought about it and thought about it and finally decided to look into it. It turned out it was a heart rate based training plan and I was not sure if I wanted to do this kind of plan. I have had a love hate relationship with heart rate training over the last three years. I had my zones tested in 2013 and started with a heart rate training plan and gave up because I was running so S L O W. I gave up after a few weeks and returned to my pace based training and did my Ironman training with my coach. The thing about training for an Ironman is you do a lot of long slow workouts and I knew I was getting better but not faster. Post Ironman I had my zones tested again to make sure I was training in the right zones based on pace and was surprised to see my new zone 1 was my old zone 3, I had improved my endurance base. The flip side was I had no speed and my zone 2 and 3 were small and I could not even get a reading for zone 4. I started adding some speed work and strength training and saw some results including my 2:02:28 half marathon in May, a PB by over 6 mins. I know that if you keep doing the same thing over and over, you will get the same results and I wanted different results, not sure what they are but I know I wanted something different so I bought the program. When I saw the program I was in shock..where is the rest of the training, 2.5 hours in the first week...WTF??? Also the heart rate zones where low, my zone 1 was 137-157 and we had a 130 and 140 bpm runs...yikes. It was week 2 of the training program and I can't say I fully committed to it, I could not unprogram my past training and believe that this would work for me. What is this I thought, I am use to doing 10+ hour training weeks, this won't work. I started to listen to the podcasts that go with the training program and read the weekly newsletters and it made sense. Coach MK is a straight talking, no bull, fast talking ball of awesome and she draws you in, Dimity is the voice of reason to me, I have followed the AMR podcasts for years and she balances MK's whirlwind, word salad approach.